Harvard Law grad Thomas makes the case for Supreme Court Justice Clarence Thomas (no relation). Just in time for the tenth anniversary of the contentious confirmation hearings that rocketed an obscure lawyer to fame (and to the highest court), this biography begins well with the compelling story of Clarence Thomas’s rise from absolute poverty in rural Georgia. 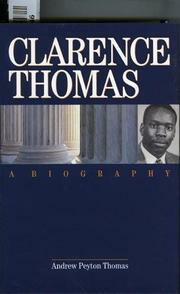 The trail from Liberty County to Yale Law School, via a Catholic seminary in Missouri and Holy Cross University, was full of twists and disappointments that make understandable Thomas’s gradual drift to the right and his disregard for the truisms propounded by the liberal establishment, especially on matters of race. Unfortunately, the second half of this account doesn’t come close to matching what precedes it. Thomas’s years at the EEOC and on the Court are related in mind-numbing detail and assessed in unconvincingly laudatory terms; every action is built up into a stunning achievement. And while the author tries to give the impression of restrained neutrality, his bias becomes increasingly pronounced around the time of the Anita Hill affair, for which his account relies to a large degree on the work of David Brock, who has recently done a very public about-face on the issue. Although a conservative viewpoint is unobjectionable, it comes entwined here with a vituperative misogyny that raises serious doubts about the rest of the analysis. This is unfortunate, as the author offers some important insights into Thomas’s development. His supposedly copycat conservatism is revealed as something far richer, emanating from a black man with firsthand knowledge of American liberalism’s failures, and the justice comes off here as stubborn, droll, rebellious—precisely the opposite of the qualities for which he is so often maligned. By needlessly attacking women, however, the author makes it likely that reaction will focus not on Thomas’s growth as a judge but once again on his relationship with Anita Hill.